Today at 1pm Eastern time, Shadowrun Returns developer Harebrained Schemes launched a $100,000 Kickstarter for Shadowrun: Hong Kong. By three o'clock the third game in the series was fully funded. It's all "co-development goals" from here. The rapid funding was largely due to rabid fans overjoyed at the thought of more turn-based tactical adventure in the tech-meets-magic world of Shadowrun, but it was also a matter of design. Harebrained Schemes set the bar low — a quarter of the $400,000 the original Shadowrun Returns Kickstarter initially sought — with the idea that fans could donate more to unlock additional game features, including new characters and additional missions. Instead of "stretch goals", Harebrained is calling these "co-funding goals". 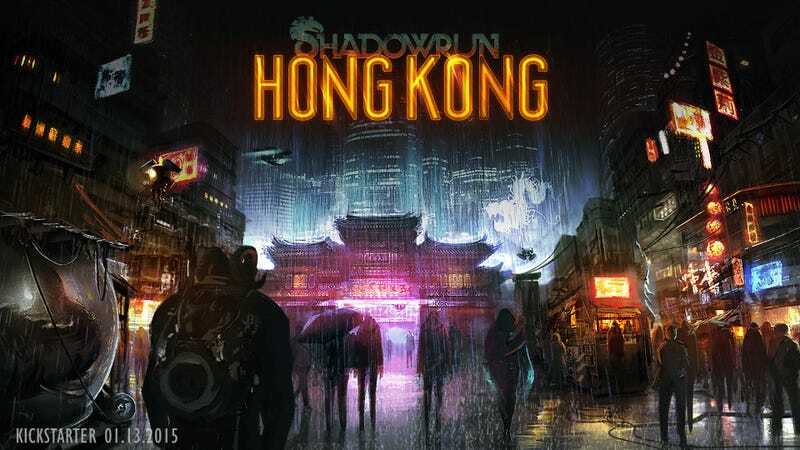 "We've already begun development of the Hong Kong game," said Mitch Gitelman, co-founder of Harebrained Schemes and Executive Producer of Shadowrun via official announcement. "We're self-funding the first 12 hours of gameplay at the quality level of Shadowrun: Dragonfall - Director's Cut. But we have plenty of ideas for features and runs that didn't fit into our budget. We love Kickstarter and we think there's no better co-funding partner than our fans to help us take our game to the next level." If the "co-funding" keeps up a steady pace, our Shadowrun adventure in Hong Kong will be quite extensive by the time it launches in mid 2015.